Join the Eastern Tech Team members and get ready to take your skiing and teaching to the next level. Focus on the five fundamentals of skiing and see for yourself how these affect the learning experience while improving your own skiing. This clinic will focus on techniques and tactics to deal with the conditions du jour which helps prepare skiers for a broader range of conditions. The groups will be small with a maximum of eight members per coach. You can expect plenty of ski time and lots of individual feedback at this event! Four skiing filled days will provide a fun, dynamic and educational event for the end of season. Once a year, we invite ALL PSIA and AASI members for one final “hurrah on the hill”! All Alpine, AASI, Adaptive and Nordic members are invited. 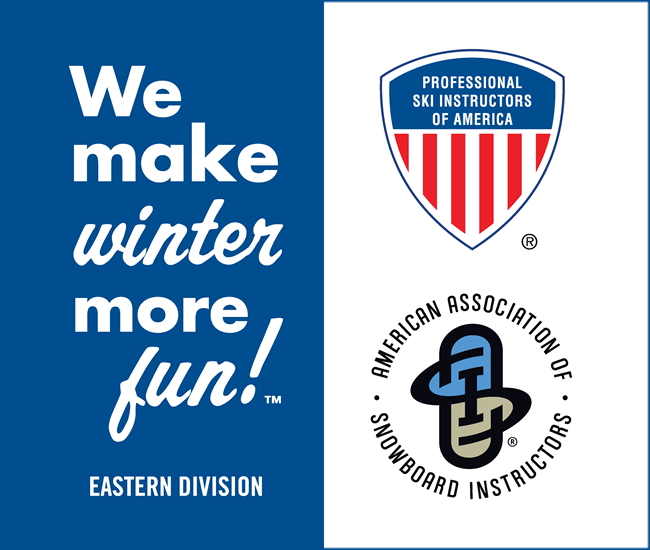 The Spring Rally is a great way to catch up on your PSIA-AASI education credits and ski or ride with new and old friends for the weekend. Ski and ride groups are organized according to certification needs, ski experience and education desires. What is spring skiing without an après ski party?! Saturday afternoon mingle with other participants during an Après Ski Party and Spring Celebration beginning at 4 p.m. Drinks and hors d’oeuvres will be available. And of course, it wouldn’t be Spring Rally without the Norwegian Party for Nordic Spring Rally Participants!